After the jump, learn why The Muppets' release to Blu-ray is felt puppet heaven! First off, allow me to admit that I love the Muppets. This goes back to my earliest memories of Sesame Street, to The Muppet Show and Muppets Tonight. It’s this thing I have about insanely funny puppets and the ways they take the seemingly ordinary (staircases, for example) and turn it into something completely classic (“Upstairs, Downstairs”) which makes them so memorable. But the real joy was watching a crusty old man like my father watching the Muppets; his reaction made me realize that these guys knew what they were doing. Fast forward to 2004, when Disney bought the rights to the franchise (minus those Sesame Street characters that weren’t owned exclusively by creator Jim Henson). And while the result was a few funny telefilms (A Very Merry Muppet Christmas Movie), the final product always left us salivating for something on the big screen. We got our wish last year when The Muppets was released in theaters to both box office success and critical acclaim. Now that this film has been released to home video, we can once again celebrate all that is good, decent, and right with the world. Our overly negative, Big-Brother-trust-no-one time certainly needs it. This film is brilliant in both its simplicity to entertain and the absolute command of human emotion which these non-CGI characters exist. Whether it’s the newcomer Walter (puppeteer Peter Linz), who idolizes Kermit, Fozzie, Miss Piggy and the rest of the gang, or those Muppets voiced by new talents, it’s their innate ability to express human emotions with such dead-on accuracy. That takes real talent, and this Muppet world certainly celebrates that through the simplest means: song and humor. Another amazingly simplistic strategy is to assume the Muppet world and people co-exist happily; so when Walter’s brother Gary (Jason Segal, I Love You Man) announces that they and Gary’s girlfriend Mary (Amy Adams, The Fighter) are going to Los Angeles to meet the Muppets, the trio naturally breaks out into song. To their shock, they learn that the Muppets are long since broken up and scattered to the winds. 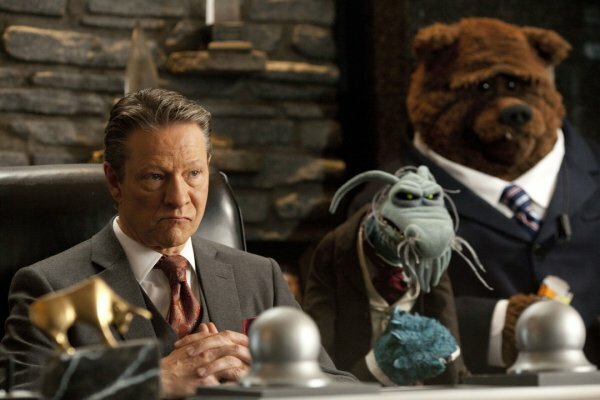 But Walter’s youthful exuberance is not to be derailed, even when he learns that the evil businessman Tex Richman (Chris Cooper, Seabuscuit) plans to destroy the dilapidated studio and take over the Muppet name. Walter convinces Kermit to perform a type of Blues Brothers séance to bring the gang back together. One by one, Kermit rescues Fozzie from a Reno nightclub, The Electric Mayhem Band from the subways, and Gonzo from the doldrums of running his own toilet/plumbing business. It’s really Kermit’s compassion and Walter’s unflinching respect for his childhood heroes which brings each one back. 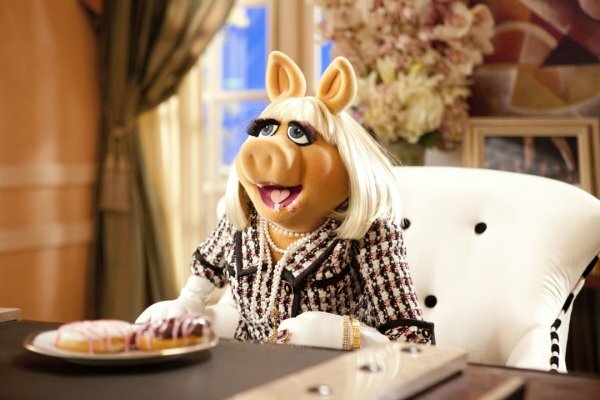 The funniest of these recruitments occurs when Kermit and the gang drive to Paris to convince Miss Piggy (utilizing the classic Muppet method of converting real miles into map miles for a quicker trip); but it’s also a bittersweet one in that Kermit and Piggy have a long history that’s recently hit the skids. We shouldn’t feel bad for felt creatures, but when Piggy rejects the offer we genuinely feel bad for our friends’ chances. 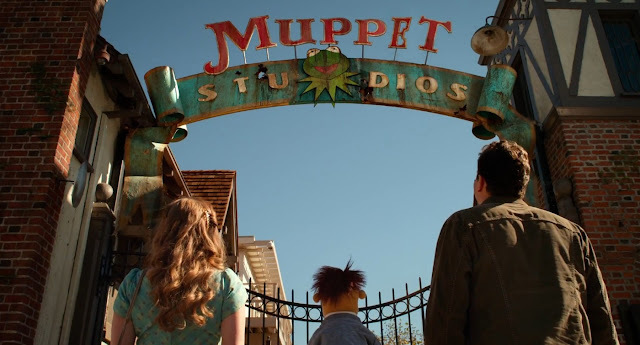 As Kermit reassembles the team and prepares for a hastily-arranged telethon, we are treated to another terrific part of any successful Muppet movie: cameos. 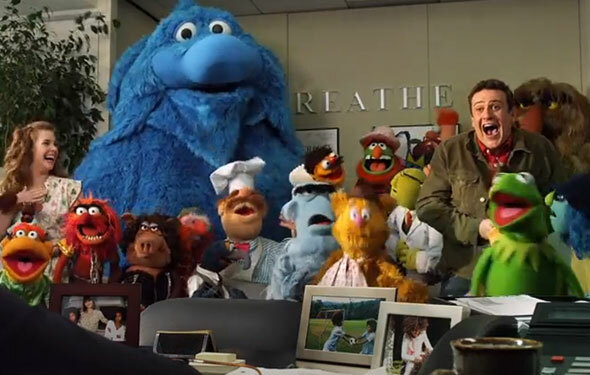 Like Gonzo’s hen groupies, there are as many as the Muppets themselves, with appearances from Emily Blunt, Jack Black, Neil Patrick Harris, Whoopie Goldberg, and (my favorite) Jim Parsons. Even after all this time, it’s clear that the parade of actors who lined up for their few moments of screen time really love their Muppets. Director James Bobbin (Flight of the Conchords) knows his Muppet lore, as well as the one thing which makes the thing work: let them be dorky, goofy, and even a little unsophisticated (Fozzie’s fart shoes crack me up every time). The Muppets’ constant awareness that they are in fact in a movie starring themselves, allowing the audience to enjoy that fact with them, is immensely entertaining. And even though the film isn’t perfect (Uncle Deadly’s Muppet was not appealing at all, the lack of Johnny Fiama/Sal and Andy/Randy Pig, and the disappointingly small part for Pepe) we don’t necessarily need them to enjoy ourselves during the film. Bobbins and Segal have done nothing short of reviving a franchise through all the Muppet means mixed with perfect nostalgia, culminating in an Oscar win for Best Song (“Man or Muppet”), and welcoming a whole new generation to Muppet mayhem. Mission accomplished! The Muppets are presented in a glorious 1080p/MPEG-4 AVC transfer, which expresses every detail of felt and every piece of wiry fur, without giving up the subtle details of the human actors. Gary's and Walter's clothing, along with set pieces are clear and detailed, while giving shadows and blacks plenty of room to play. I noticed zero edge enhancements or haloing, and color saturation is terrific. I've always wanted to see Muppets use their legs, so whether CGI or other human tricks were used in pulling off those scenes are not exposed at all by the absolute clarity of the transfer. This is one of my favorite transfers of 2012, with nothing lost from the theatrical copy. It's clear that Disney placed a high production value on The Muppets, a fact which is further displayed in a stunning DTS-HD Master Audio 7.1 surround track. Dialogue and musical numbers don't require remote control adjustments, with both sounding absolutely terrific. The surround track wraps the listener in a variety of Muppet sound effects, car cabin radio interludes, explosions, and kidnappings (one of my favorite scenes). I loved the LFE, which powerful and solid, which certainly plays the music and lights the lights. Scratching the Surface: A Hasty Examination of the Making of Muppets (HD, 16 minutes): This mockumentary about the film is a great example of Muppets tomfoolery. No real production details are released here, but it's hilarious how well the Muppets mocjk even themselves. It's an instant classic. Deleted Scenes (HD, 10 minutes): Eight deleted scenes are available -- "Walter's Nightmare," "Life's A Happy Song Missing Verse," "A Hero in Hollywood," "Credit Card Club," "Muppets in Jail," "Bowling for Beaker," "The Strip Mall Awards" and "The Complete Muppet Telethon Opening & More." While they were fun to watch, it's understandable why none of these made it into the final cut. Explaining Evil: The Full Tex Richman Song (HD, 3 minutes): Cooper’s rapping scene was a nice surprse, as we’re so used to seeing his dramatic side. Even though some bashed his performance, I thought this longer version of Cooper’s rap scene was enjoyable. The Longest Blooper Reel Ever. At Least In Muppet History... We Think (HD, 9 minutes): It's uncanny how the Muppets can exist in two worlds – that of their completely fabricated existence, and of the real world. This blooper reel is enjoyable from this perspective, as the Muppets act within themselves, missing lines, getting hair out of place, and generally carrying on as if they were flesh and blood creatures. A Little Screen Test on the Way to the Read-Through (HD, 3 minutes): A fun little short with Kermit, Fozzie, Walter and Segal as they make their way to a read-through of the film's script. Theatrical Spoof Trailers (HD, 9 minutes): Another epic piece to the movie campaign was the release of several wonderful spoof trailers. These created a terrific pre-release buzz, solidifed any early concerns fans had about quality control, and ensured a solid opening week. 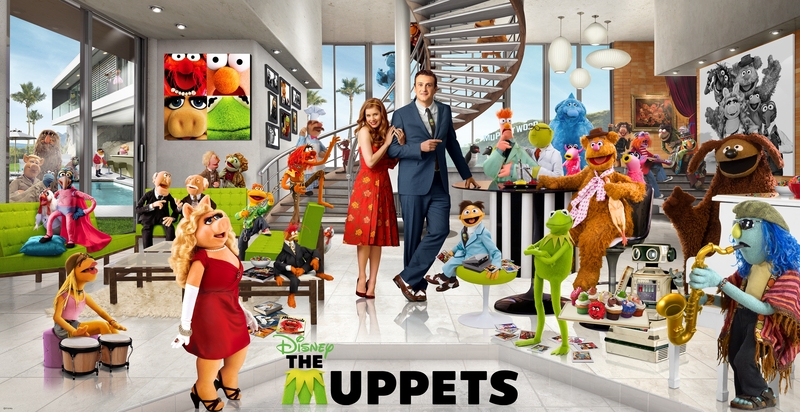 Trailers include "Rise of the Muppets," "Never" "Green with Envy," "The Fuzzy Pack," "Being Green," "The Piggy with the Froggy Tattoo" and "Green with Envy, the Spoof Spoof Trailer." Full-Length Original Soundtrack: If you purchase 'The Wocka Wocka Pack,' you are treated to a code to download the film's full soundtrack. While the lack of an actual disc is disappointing, the music is straight-up legit. If you want this one, be careful as some versions do not include this offer. Various exclusive packaging, including the Best Buy Exclusive Lunchbox, Target Wocka Wocka Pack with 6-episode sampler of The Muppet Show, and Walmart Finger Puppets: I love that Disney made so many versions of the film available. My suggestion is to purchase the Best Buy Lunchbox and all the discounts associated with it. To see more information about the offer, please visit this link. The Bottom Line – 4.5/5As a line from one of the spoof trailer reads, 'The Fuzzy Pack is Backy-Back!' This is a solid home video release, complete with hilarious supplements and a wide variety of purchase options. With my favorite video and audio transfers of 2012, The Muppets is a first-day purchase to be sure. 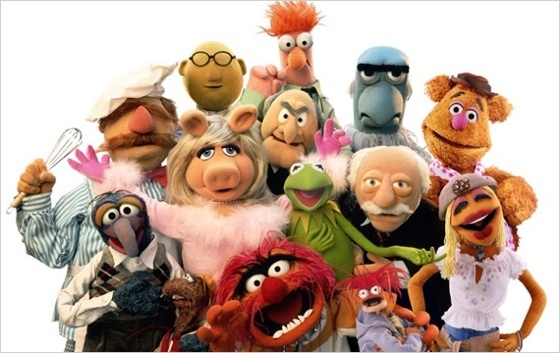 Friends, revel in the glory that is The Muppets, and remember a time of rainbow connections, Mahna Mahmas, and King Prawns.